Great for deep cleaning carpets using the added power of a buffer! Tired of scrubbing your carpets by hand to get them clean? Use the DI Brushes Carpet Brush for Buffers and save valuable time and energy while improving your results! Cleaning your carpets can be tough with hard to reach areas and small nooks and crannies on the interior of your vehicle. Sometimes you simply can not get enough range of motion with your arm to clean your carpets effectively. This is where the DI Carpet Brush for Buffers comes in handy! This brush features a hook and loop backing which allows it to easily attach to your rotary or dual action backing buffer. That's right, you can attach it directly to your buffer for added cleaning power! 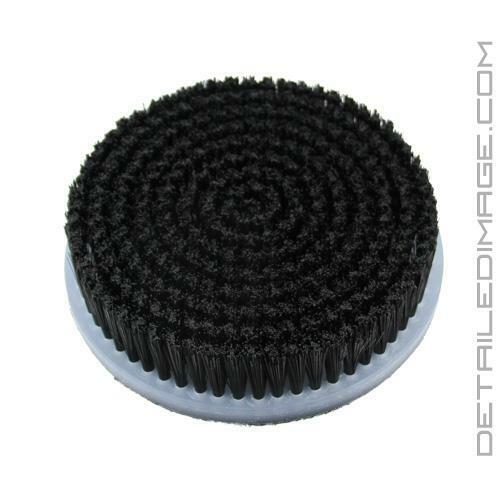 This brush measures 5" in diameter, making the Lake Country DA 5" Backing Plate or the Lake Country Rotary 5" Backing Plate the perfect fit! This brush is packed with semi-stiff polyproplylene bristles that measure 7/8" long. These bristles are soft, yet strong enough to deep clean your carpets with ease. Just like polishing your paint attaching this brush to your buffer provides a superior number of passes and coverage that is nearly impossible to duplicate by hand. To use it simply attach it to any hook and loop backing plate and then turn your buffer on and let it do the work for you. Before you know it you will be left with clean carpets and mats that look like new! We also highly recommend using this brush on stubborn stains with a great carpet cleaning solution like the 303 Cleaner & Spot Remover. So what are you waiting for, save valuable energy and clean more effectively with the DI Brushes Carpet Brush for Buffers today! Detail shop loves this brush on a Rotary machine, spray a citrus cleaner down, then use this brush and carpet looks new. We just bought it a few weeks ago and have used it on probably 30 cars now lol! It's a great tool to have, we're gonna order another one and keep it as a backup and use a dedicated carpet da for it! I love how this thing works, even to knock dry dirt loose. It seems like it would work great. Make sure to use it at a slower speed, as I foolishly lifted up when i had my PC pegged at 6 (i was ready to be done). It nearly flew across the garage.